The USA Today and Facebook Super Bowl Ad Meter for 2012 has launched and now the details have been revealed how the voting for the Super Bowl 2012 Ads will work. 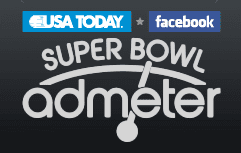 The USA Today Ad Meter is the gold standard for Super Bowl Ad rankings. The ranking is seen as make or break for advertising agencies since years. This year the USA Today Admeter will be different though. USA Today has so far just used a small panel of viewers to determine the best Super Bowl ads. This year USA Today partnered with Facebook and you are in control of the ranking. To cast your votes you need to have a Facebook account. 800 million people have, why not you? The Super Bowl Ad voting starts at 6:30pm ET, the Super Bowl 2012 Kick-Off Time. The Ad Meter voting ends on Tuesday, Feb. 7 at 6pm ET. The 2012 USA Today Ad Meter winner will be announced on Tuesday, Feb. 7 at 10pm ET. Click on the video thumbnail and view the ad. Then rate the ad by clicking on a star on the 5-star scale. 5-stars mean you "Loved It". 1-star - it's a "Fumble. You can only vote once for each ad. Each rating has a score (1-5). Average rating will be the total of all scores / number of users who rated. Results will be ordered with the highest-to-lowest average total rating as determined by the sum of all user ratings divided by the number of ratings. In the case of a tie, the video with more ratings will be the winner. In order to be eligible for the leader-board, a video must receive at least 1000 votes. Access the new USA Today Facebook Admeter 2012 site here. For more Super Bowl 2012 Voting sites visit our Super Bowl Ad Voting Guide. Watch All Super Bowl 2012 Ads Now!